Vassily Ivanchuk arrived to Prague directly from Sofia, where he had just finished participation in the Mtel Masters Tournament. “Mr. Ivanchuck came with good spirit”, said the festival director, Pavel Matocha. “He doesn’t know the reasons for his poor result in Sofia and he probably isn’t even thinking about that. Vassily told me, that as a professional, he has to accept the defeats.” added the president of the Prague Chess Society. Ivanchuk’s second GM Manuel Leon Hoyos from Mexico, who will be Ivanchuk’s second for the match against David Navara, also arrived today. They went downtown for some sightseeing, but discussed more about history of chess than the history of Prague. 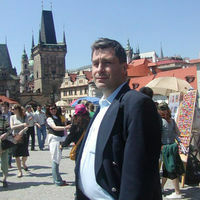 By the way, Ivanchuk has positive memories on the capital of the Czech Republic, as he earlier played in the strong Eurotel World Chess Trophy 2002. The first move will be made by the new prime minister of the Czech Republic (which is also presiding the European Union at the moment) and any irregularities similar to the first round in Sofia simply cannot happen – his name is Fischer. Drawing of lots took place during the Tuesday evening party, and Ivanchuk pulled a black pawn from the Lebanese specialty called sambousek jibne. Therefore, David Navara will play with white pieces in the first game. The games will be transmitted on the official website and Novoborsky SK with live text commentary by GM Marek Vokac. Chat for the spectators will be also enabled.